According to the leading tourist guide Lonely Planet, the best time to travel to Moscow is late spring and early autumn. At this time the Russian capital holds two main running events of the country. In May, central streets of the city are blocked for the Moscow Half Marathon, in September – for Russia's largest running event, Promsvyazbank Moscow Marathon. The organizers of the races invite runners from Germany – and other countries – to visit Moscow and run the Moscow Half Marathon and Promsvyazbank Moscow Marathon and enjoy the main sights of the city. Number of participants: 13,701 finishers in 2017. The weather on race day: the average temperature +16 C, a little cloudy. The Moscow Half Marathon is the biggest half marathon in Russia. The race course runs in one circle along the central streets of the city. From the distance you can see the main sights of the Russian capital, including the Kremlin and the Cathedral of Christ the Savior, and take a look at the recently opened Zaryadye Park. This race unites the past and the present of Moscow, a modern metropolis with rich history. In addition to the half marathon, the competition includes the race for 5k or 10k which is good for those who come to Moscow with family and friends. At the finish, participants of all distances are awarded with medals. The cost of participation: starts from 25 Euro. Number of participants: 20,652 finishers in 2017. The weather on race day: the average temperature +15.5 C, clear or slightly cloudy. Promsvyazbank Moscow Marathon is the largest running event in Russia and also the most popular marathon in Russia. Athletes from more than 70 countries of the world take part in the race. The most numerous groups of foreign runners come from France, Britain, Ukraine, the USA and Germany. The race starts and finishes on the territory of the renewed Olympic complex "Luzhniki". In the summer of 2018, the complex hosts the Football World Cup. The race course runs in one circle in the heart of the capital. It is measured and certified by the Association of International Marathons and Distance Races (AIMS). From the distance you can view the world famous sights of the city. Among them are the Bolshoi Theater, the Cathedral of Christ the Savior and four of the seven Stalin skyscrapers. 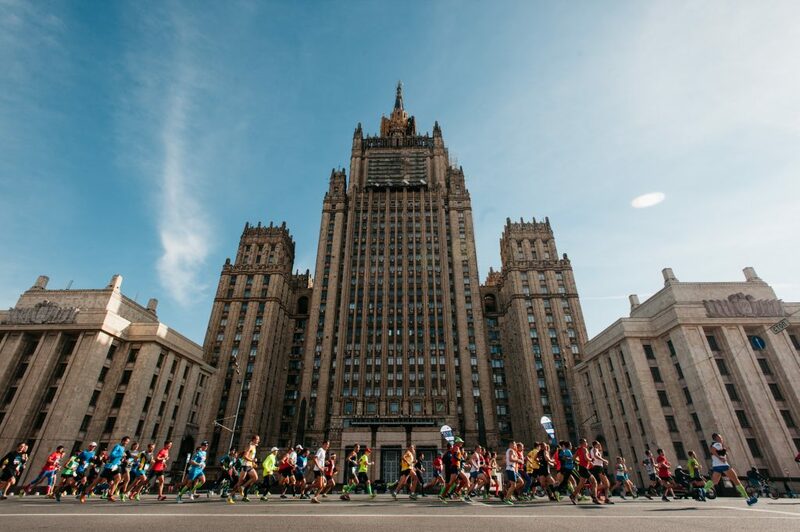 Participants will run past modern Moscow-City skyscrapers and along cozy boulevards, through the central streets of Moscow and even under the walls of the Kremlin. Within the main running event, you can compete at the 10k distance. At the finish, participants of all distances are awarded with medals. The cost of participation: starts from 30 Euro. There are four international airports in Moscow. Three of them are connected with the city by comfortable high-speed trains. They deliver passengers to the city center in 35-45 minutes. Daily direct flights connect Moscow with Munich, Berlin, Frankfurt am Main, Dusseldorf and Hamburg. Travel time: 2.5 hours from Berlin, 3 hours from Frankfurt am Main. The official hotel of Promsvyazbank Moscow Marathon is a business class hotel "Azimut". It is located near the race course in 15 minutes by subway from the start area. The official tour operator of Promsvyazbank Moscow Marathon is the "PAN Tours" agency. It provides alternative accommodation options, visa support, sightseeing and transfer services. To book a hotel and other tourist services, please contact travel@moscowmarathon.org or to the official travel partner of Promsvyazbank Moscow Marathon in Germany Grosse-Coosmann Sportreisen ( www.gro-co.de , p.vetter@gro-co.de).